It’s time for a new challenge at AAA Cards! The theme for this fortnight is ‘along the edge’ with the optional twist of sewing. Our sponsor is Stamplorations. I had originally planned to use one of my pretty edge punches that I have been hoarding keeping hold of for the past decade. Although I happily moved to wafer-thin dies some time ago, I have never been able to part with my punch collection. I think it’s because I invested so much in them at the time. I remember how difficult it was for us in the UK to get hold of those Martha Stewart punches when they first came out…. and how I used to love looking at them in person whenever I went to craft stores in the US. Yes. Well, that’s a nice memory…. because I very quickly remembered WHY I was so happy to move to wafer-thin dies. Punches are a complete nightmare with thicker cardstock. I really tried with one beautiful edge punch which got stuck on multiple occasions… and accidentally fell into the bin at one point. I fished it out.. but it’s fair to say that my romantic memory of punches has been eroded and quite a few punches will be finding their way out of my house imminently! So I turned to my die collection – lots of choice there and requiring MUCH less elbow grease! I chose the Cascading Hearts die from Technique Tuesday. I didn’t want to fill in all the hearts as I liked seeing the white of the back of the card through the open hearts. Instead I added some patterned vellum to just a few of them. 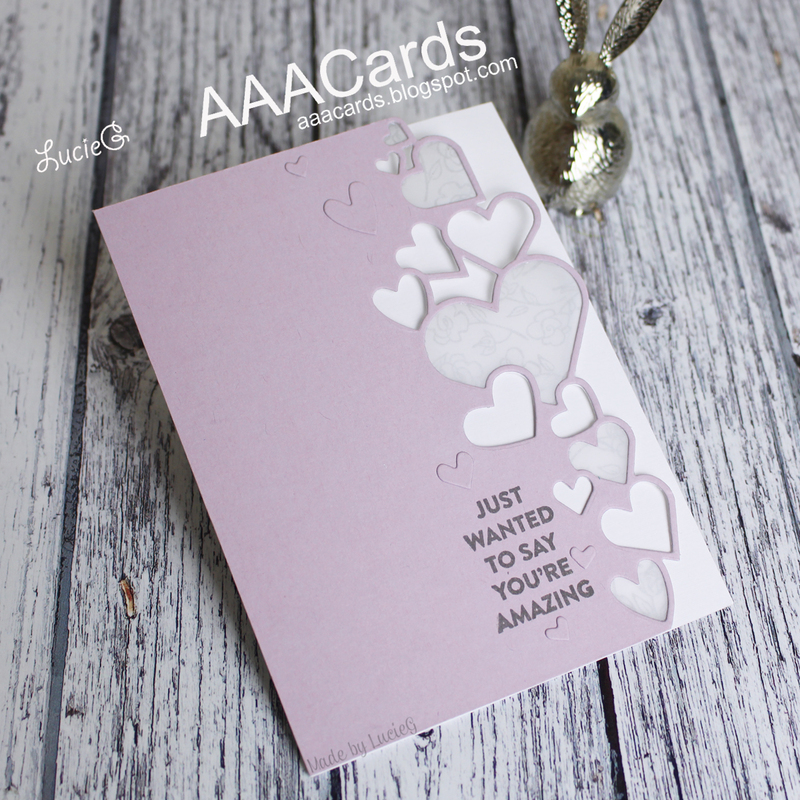 My team mates have come up with some beautiful cards which are on the AAA Cards challenge blog. We are also joined by the talented Michelle from Seashell Creations – she has some beautiful cards on her blog! Today I’ve been playing with a few of my Poppystamps dies to create another Easter card… well it is that time of year! I paired a die from the Country Baskets set with the new Peek a Boo Bunny. The bunny is attached to a square frame which I cut off but I stuck his little paws onto the basket because they are just too cute! To finish off the card, I added a sentiment from Clearly Besotted and a few eggs from an old Marianne Designs die. 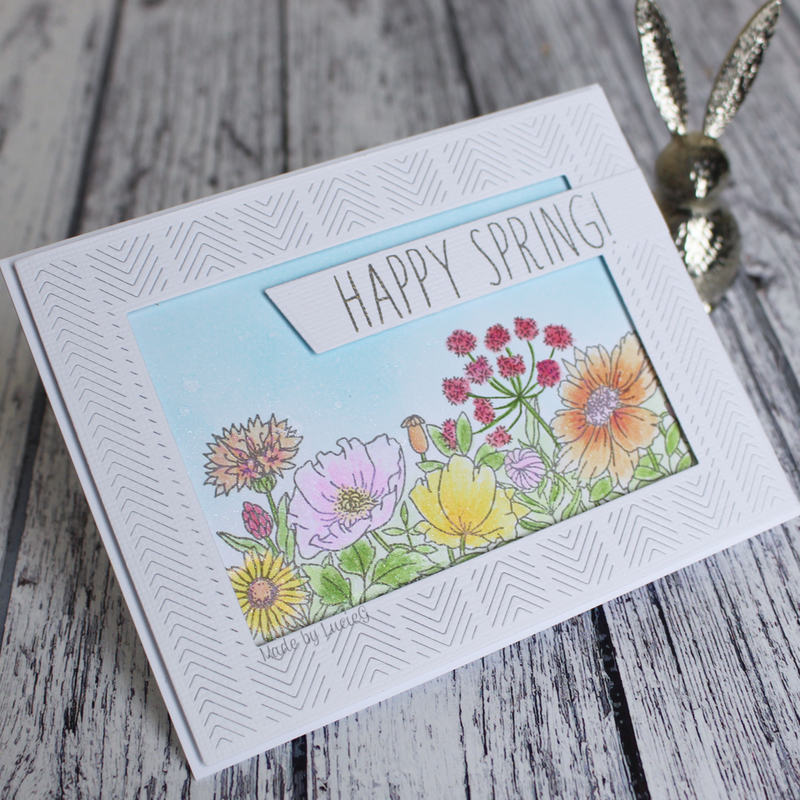 I’m entering this into the current Poppystamps challenge which is all about things that make you happy in the garden – and hey, bunnies and Easter egg hunts bring a lot of happiness! Today I’m playing with another new background die – the fabulous Hero Arts Papel Picardo die! I decided to create another Easter card using older stamps from Simon Says Stamp and the current palette for the Color Throwdown challenge (mint, aqua, dark pink and green). I’m also entering this into the Simon Says Stamp Flickr challenge (anything goes) and the Simon Says Stamp Wednesday challenge – no designer paper! I’m playing along in two challenges today – the Case This Sketch challenge and the Memory Box April challenge where the theme is clean and simple. I chose an ‘oldie but goodie’ Memory Box die that I have had for many years – the pretty Waltham Egg and coloured it with my Zig brushmarkers before adding some highlights with my Prismacolor pencils. I then added a generous coat of Pixie Dust, which hopefully you can see a bit of in the second photo! I adhered it to a couple of die cuts to provide some dimension, before sticking it onto an oval base that I had smooshed with Tumbled Glass distress ink. I added some Basic Grey papers as per the sketch challenge and carefully stamped the sentiment from Simon Says Stamp. Finally I added some tiny Nuvo drops. Hello friend and happy Saturday! Today I’m playing along with the current Freshly Made Sketches challenge. As soon as I saw the sketch I thought of my Arrow Mat border die from Avery Elle which I haven’t used enough yet! Perfect for the border! I inked up the gorgeous Mama Elephant Wild Meadow stamp, which were so much fun to colour! I blended some distress ink to create the sky and then added a generous spritz of watered-down Pixie Dust. Hope you can see that gorgeous shimmer! To finish off the card, I added a sentiment from Simon Says Stamp. I bought the set on clearance and whilst I rarely use the images in the set, that sentiment gets a LOT of use at this time of year. There aren’t that many spring sentiments out there!